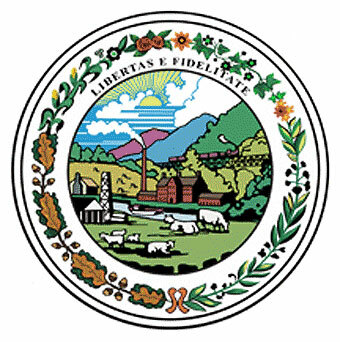 West Virginia's official state seal; includes the date it became a state, the Latin state motto "Montani Semper Liberi" ("Mountaineers are Always Free"), and symbols of agriculture, mining, industry, and defense of liberty. Photo by Joseph H. Diss Debar (1863)/Flickr (Public Domain Image). Two crossed rifles and a Liberty cap in front of the boulder represent the importance of fighting for liberty. The farmer on the left with ax, plow and cornstalk is a symbol of agriculture. On the right stands a miner with pickax, anvil, and sledge hammer (a symbol of industry). The center design of the seal is considered the arms of the state, which also appears on West Virginia's state flag. 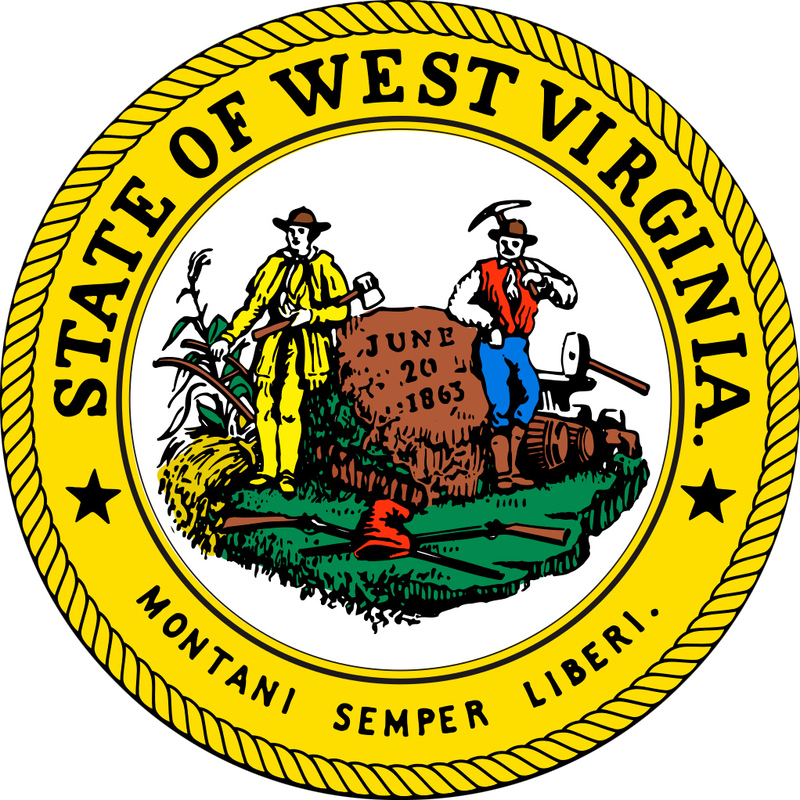 In the outer ring, the text "State of West Virginia" sits above the state motto: "Montani Semper Liberi;" Latin for "Mountaineers are Always Free" (West Virginia's nickname is "The Mountain State"). There is also a reverse of the West Virginia great seal, used as the official seal of the Governor. 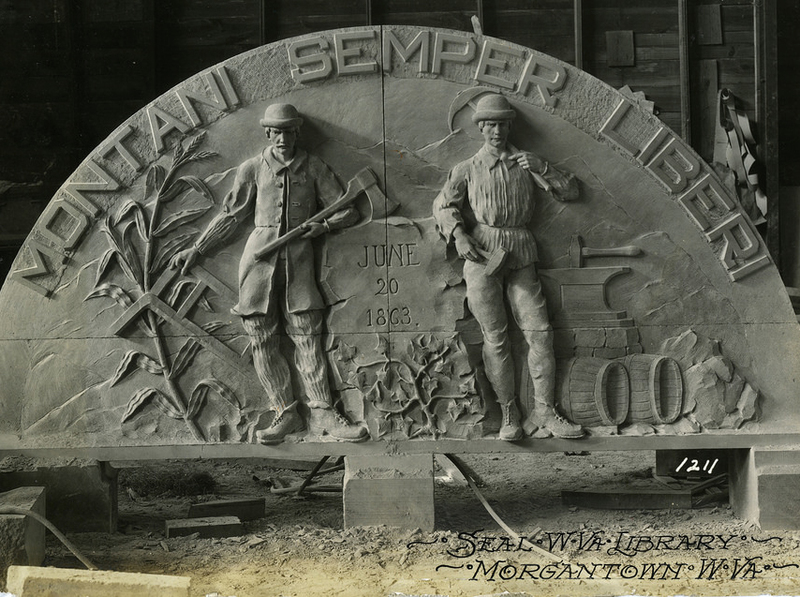 West Virginia's state motto (Montani Semper Liberi); carved on a stone seal that belonged to a library in Morgantown, West Virginia. Photo by Mathers Museum of World Cultures/Flickr (noncommercial use permitted with attribution). 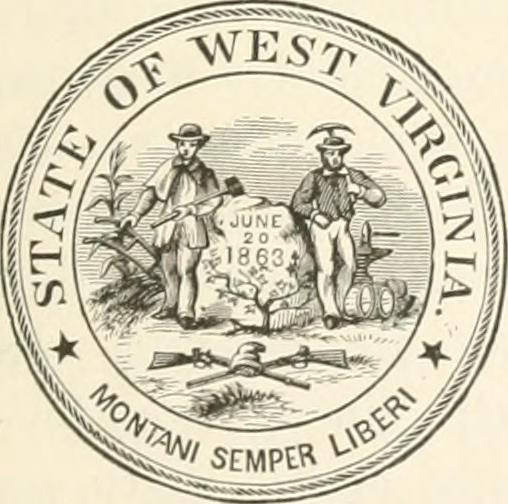 1894 image of the West Virginia seal; photo by Internet Archive Book Images on Fliickr (no known copyright restrictions). Reverse side of West Virgina's great seal (used as the Governor's seal).